A hotbed in metal as of late has been South America. Beyond the fervent fanbase and infamous Rock in Rio festivals from Brazil, there has been a solid movement for the bands pushing their creative forces to the world. 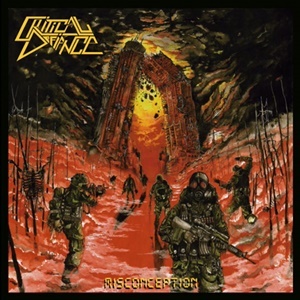 Critical Defiance from Chile add their thrash storm to the mix and have since 2013. They’ve released two demos and a split release with fellow thrash band Parkcrest prior to Unspeakable Axe picking them up for a debut full-length in Misconception. And while clearly gaining inspiration from the early Bay Area brigade of that initial movement, it’s always fascinating to see what lens they look into and aspects that focus on to partake on their style – which hopefully still retains a level of uniqueness or at least impressive execution. The pacing tends to be frantic, featuring heads down ripping riffs, blazing lead tradeoffs, and gruff/roaring vocals that match the intensity of the proceedings on display. When the group chooses to slow down in spots for “Spiral of Hatred” and the instrumental sections within the 7:26 “Onset”, it’s clear that some traditional/NWOBHM musicianship comes to the forefront, the combinations of harmonies and transitions well thought out and giving these arrangements hypnotic hooks to hang upon. It’s obvious that early Metallica, Exodus, and even Dark Angel received modest airings for these gents growing up, and the production values appear much more primitive and less ‘pristine’ than even many current thrash artists on the scene – kudos for putting the meat on the bones so to speak in that regard. The tribal drumming that opens “What About You” soon succumbs to another blitzkrieg sonic assault – the type that gets pits in a frenzy and offers severe cranial damage aligning with early Sodom or Sepultura for comparison’s sake. The vocals are acidic, brutal, and yet remarkably clear even when matching the speed of the music – be it breakneck or modestly mid-tempo, the latter best achieved on one of the highlights of the record “Pursuit of Chaos” where the lead break out-Hammett’s Kirk’s trademark work. We all know that originality in thrash was pretty much done in the early 90’s – now it’s about paying respect to the genre without obviously lifting and reusing well-known riffs, hooks and melodies to pass off as your own. Critical Defiance are purveyors of the raw, adrenaline-oriented nature of this music, while maintaining those cohesive ‘catchy’ moments needed to achieve optimal song retention. Misconception as such delivers and will appeal to most thrash mavens.